Spring is here and with it comes a spark of freshness. Newness. The long, cold winter has faded from our memory (at least for some of us) and we look to the colorful spring to fill us with the hopefulness of warmer and brighter days. However spring isn’t just about young and supple flowers and the trees bursting forth with new foliage. This season is about the commencement of another six-plus months of ash and maple tree trunks being flung into the speeding paths of horsehide-covered rubber. The sounds of snapping leather and cracking wood are pronounced on sand lots and stadiums across the country as March rolls into April. It seems that nothing, not even war, can get in the way of baseball. With the advent of free agency and sports talk radio, baseball’s off-season has been virtually eliminated for the fans of the game. For baseball memorabilia collectors, off seasons are only measured by the distances between paydays and the cache of available…cash with which to acquire the next collectible. For collectors (like me) who are much more interested in the extremely finite military baseball genre, the off-season can be varying due to the increasingly limited number of available pieces which we pursue. For me, the off-season has been more of a spectator sport as I witnessed two vintage military baseball uniforms listed at auction (online) only to pass by virtually unnoticed, only to be re-listed with incrementally decreasing opening bid amounts with each iteration. Had the timing been more in line with my budget, one (or both) would have found their way into my meager collection. In addition to the two listings I was focusing on, there were several uniforms (all USMC baseball uniform sets and jerseys from an array of eras) that seemed to be gobbled up by hungry collectors. These uniform listings (and sales) were entertaining to watch though I had no committed interest. “ENG GP” lettering references the Engineers Group – of the 116h Infantry Regiment (source: eBay image). Unlike the WWII USMC baseball jerseys of similar design, this one has a MacGregor manufacturer’s tag (source: eBay image). The first real gem that caught my attention was a late 1950s road gray baseball jersey from an engineer group that appeared (due to the “116” numerals on the left sleeve) to be part of the 116th Infantry Regiment. The appointments of the jersey were very similar to those of the road gray USMC jersey in my collection. The aside from the lettering on the front and sleeve, the differences between the two are the thickness of the soutache and the presence of a manufacturer’s tag (the USMC jerseys are limited to a size tag). The Engineers Group jersey also lacks the color-matched button (aligned over the “I”) – which isn’t required due to the alignment with the lettering. With this auction listing ending only a few short weeks following the Christmas shopping season and the damage my financial resources sustained, I had to let the auction pass me by (for more details, see the 116th Infantry Engineers Group jersey on the Archive of Military Baseball Uniforms and Jerseys. This auction generated a fair amount of interest when it was listed for $79 at auction – selling for less that $150. The uniform appears to date from the 1920s (source: eBay image). Showing the vintage manufacturer’s tag: Thomas E. Wilson & Company – known today as Wilson Sporting Goods Company (source: eBay image). More recently, a very intriguing baseball uniform online auction listing made its way through the e-bidding circuit having been listed and re-listed several times before it finally sold. Clearly an early piece, the jersey was constructed with long sleeves and a collar and sported dark blue pinstripes. The styling is consistent with uniforms of the 1920s. 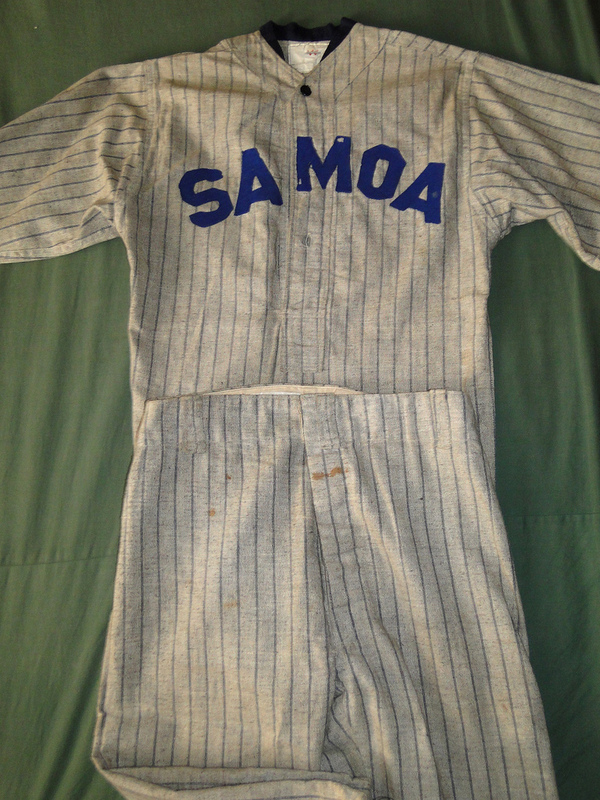 The seller’s supposition that the “SAMOA” lettering sewn across the chest correlates to a U.S. Navy team (consisting of active duty personnel stationed at the Navy base in American Samoa). One can certainly deduce that the jersey is indeed military, but there is no hard evidence to prove or disprove this idea. I’ve scoured my resources in search of any information regarding a Samoa team connected to U.S. naval station at Pago Pago. 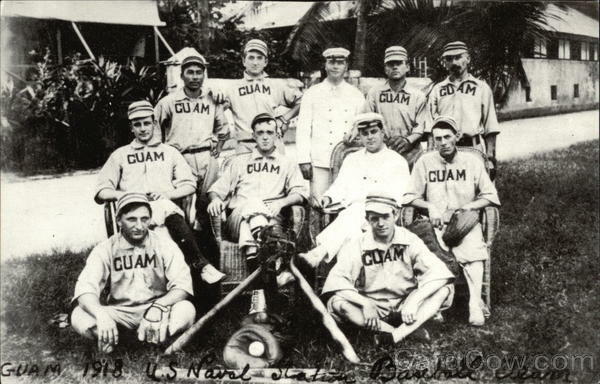 This photo postcard of the 1918 U.S. Navy team from Guam shows uniforms that clearly pre-date the Samoa jersey. Note the full-collared jerseys and the stovepipe ball caps. 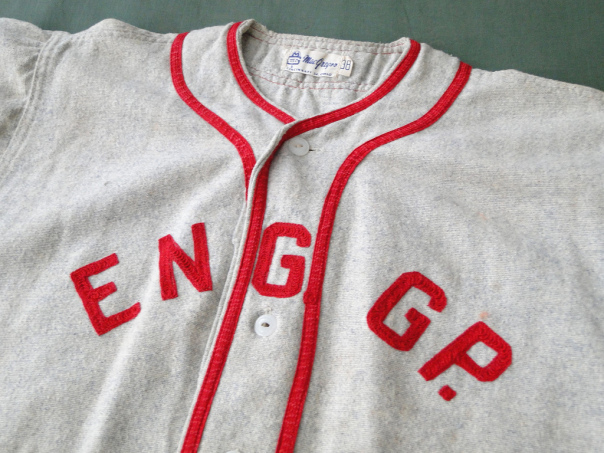 Burleigh Grimes’ 1926 Brooklyn jersey sold for more than $31,000 in a 2004 auction. This design is very similar to the “U.S. Navy” Samoa jersey (source: Robert Edward Auctions). Hall of Fame baseball major league pitcher, Burleigh Grimes shown wearing his Brooklyn Robbins (Dodgers) uniform with the collar, sleeves and pinstripes. Grimes played for Brooklyn from 1918-1926. The “Samoa” jersey certainly possesses features and design elements that lend credibility to the idea that the jersey is authentic and for a sub-$100 investment, it would be well-worth the risk.